Note: Jean-Philippe Darcis is now closed. I have been on a mission to try all the afternoon high tea places in Singapore. One would imagine that there are plenty of nice dessert places to go for a leisure afternoon tea. But the problem is, I have been to most of them, and sometimes, I end up going to the usual ones because there are only that few high tea places in town. After having dim sum at Paradise Pavilion, my partner-in-crime and I were greedy for more food, and we I suddenly thought of the macarons at Jean-Philippe Darcis, Marina Bay Sands. Life is good when you have desserts after dim sum. If you have been reading my food blog for a while, you would know that I love cakes and I am always on the lookout for dessert places in Singapore. With so many new patisseries, cake and pastry shops opening this year, I think dessert lovers are living in exciting times. Bonheur Patisserie at Duxton road, is a fairly new confectionery in Singapore which specialises in customised wedding cakes. They also have a dine-in cafe where you can order a slice of cake for a nice afternoon high tea. Father’s Day is celebrated on the 3rd Sunday of June each year. I am sure everyone had a good feast during Mother’s Day last month, so it’s only fair to make plans for a good Father’s Day celebration! Every special occasion is an excuse for us to eat. I finally went to PS Café! I’ve been meaning to try out PS Café for the longest time, but somehow I did not get the chance to. PS Café has four branches in Singapore (Ann Siang Hill, Dempsey Hill, Paragon and Palais), and each of them gives a different vibe. For the PS Cafe Palais Renaissance outlet, the interior is chic and classy with dim romantic lighting. It also has a lovely white-tiled terrace dining area if you prefer to dine outside. There are many nice Cafes in Singapore, what exactly makes PS Cafe so popular? 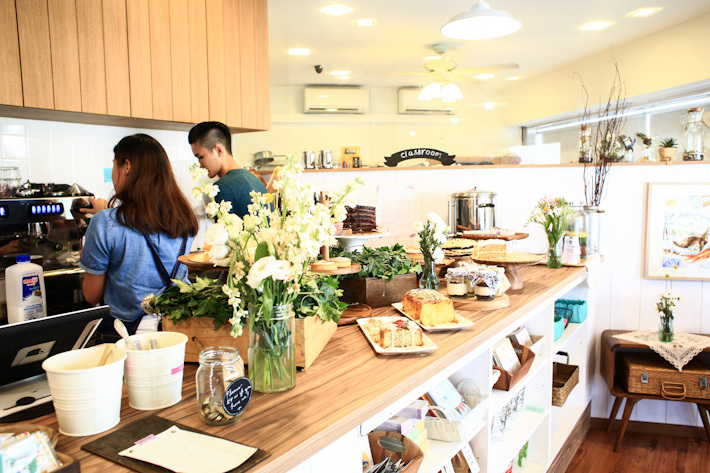 This guide to the best cafes in Singapore was last updated on 26 October 2014. Cafés have different interpretations in different countries. In the American context, a café or coffee house is a casual restaurant serving proper food and sandwiches. Whilst a café in other countries is simply a place that serves coffee with light snacks/desserts. Who can resist the lovely smell of brewing coffee, the chic display of desserts on cake stands, and the cosy ambiance of a cafe? UPDATED: The Regent Singapore Weekend High tea Buffet Giveaway is now closed. I will be announcing the results on twitter later in the evening. Thank you for participating. The winners of Weekend High Tea giveaway are: #90, #454, #1061, #174, & #730. The Regent Singapore’s Tea Lounge is well known for their afternoon tea in Singapore. On weekdays, they serve the traditional English Afternoon tea on a 3 tier stand. They also have a very popular Weekend High Tea Buffet which is always fully reserved. The Tea Lounge has recently revamped their weekend High Tea Buffet selections with more tantalising choices. I am partnering The Regent Singapore to giveaway five pairs of the Weekend Afternoon Buffet High Tea ($44++/pax) at The Tea Lounge.